Starring Nicholas Hoult, Kevin Spacey, Sarah Paulson, Hope Davis, Victor Garber, Zoey Deutch, Lucy Boynton, Brian d’Arcy James, Adam Busch, James Urbaniak, Eric Bogosian, Anna Bullard and Amy Rutberg. Distributed by IFC Pictures. 106 minutes. Rated PG-13. This may sound a bit contradictory, but even though JD Salinger had a truly fascinating life, he was not a particularly interesting person. He may have created Holden Caulfield as a literary doppelganger for himself, but in real life he was no Holden Caulfield. Or perhaps he was, if Holden grew up to be jaded, be bitter, be a loner, take himself way too seriously, be paranoid, hold massive grudges for the tiniest slights, and be a little persnickety. Come to think of it, Holden may very well have grown up to be that way. His creator certainly did. Salinger was a brilliant writer who essentially is known for one flash-in-the-pan near-perfect novel and several very good early short stories (though he did later write three other books of novellas and short stories, to much more muted praise). He was a man who obsessed by women, but would rather spend his time with girls. (Like Caulfield, when a woman grew up and had experience he found them somewhat tainted.) As a soldier, he had one of the most horrendous experiences imaginable – he was one of the American soldiers who first liberated a Nazi concentration camp at the tail end of World War II, an experience that scarred him for life. And when he could not make lightning strike again with his novels, he walked away from it all, moving to a small town in New Hampshire and never writing again – or at least not anything for anyone but himself to see. Like I said, Salinger had a lot of big contradictions in his life. Unfortunately, this rather white-washed bio-pic is not quite sensitive enough to bring these huge life events to full dramatic life. In fact, in some parts, it doesn’t even try to tell the man’s true story. The film particularly glosses over his propensity for teenaged girls, making it a punchline of a joke the one time it is mentioned. The movie also barely touches upon the concentration camp experience which did so much to define him, limiting it to a few silent shots which do not explain the importance of what was happening. So, what we do have here is a very smart, pithy, talented man who has pretty much everything handed to him, and yet he feels betrayed by life, and that anyone who does not understand him is being “phony.” Some of the more interesting parts – his battle with PTSD after the war, or his spiritual awakening – are explored in more depth, but the film eventually drops these threads as well. In the meantime, Salinger was often cruel, or at the very least unfeeling, towards his parents, his two wives, and most of all to his mentor Whit Burnett of Story magazine (played by Kevin Spacey). Salinger cut Burnett off and forced him to beg forgiveness for years, over a slight that was not even Burnett’s fault. In the end, Rebel in the Rye has a bit of a basic problem. Showing Salinger just writing would be horribly uncinematic (and just plain dull). But when he wasn’t writing, the man was kind of a jerk most of the time – self-important, judgmental, easy to anger, holding long-time grudges over perceived slights, and unwilling to listen to anyone else’s ideas. At one point towards the end of Rebel in the Rye, Salinger admits that he is not a good husband, he is not a good friend, but he is a good writer. This was undoubtedly true. However, it brings up this concern: Wouldn’t our time be better spent foregoing this picture about his life, and instead just rereading The Catcher in the Rye? Copyright ©2017 PopEntertainment.com. All rights reserved. Posted: September 13, 2017. 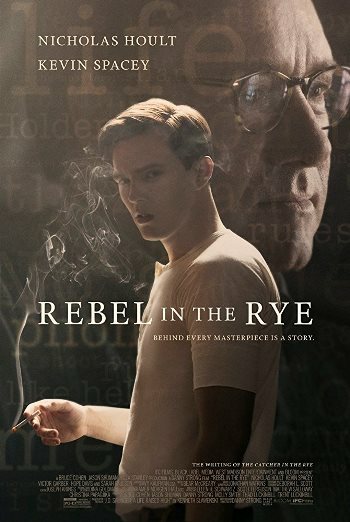 Tags: A Catcher in the Rye, Adam Busch, Amy Rutberg, Anna Bullard, Brian d'Arcy James, concentration camp, Danny Strong, eric bogosian, Holden Caulfield, Hope Davis, James Urbaniak, jay s jacobs, JD Salinger, kevin spacey, Lucy Boynton, movie review, Nicholas Hoult, PopEntertainment.com, Rebel in the Rye, reclusive, Sarah Paulson, Story magazine, teen girls, The New Yorker, Victor Garber, Whit Burnett, Zoey Deutch. Bookmark the permalink.